How to have iPad play movies with AC-3 5.1 channel? Can iPad play the AC3 track in iTunes movies and TV shows? Yes and No. Check the new iPad/iPad 2 specifications and you’ll find that the new iPad and iPad 2 actually support “Dolby Digital 5.1 surround sound pass-through with Apple Digital AV Adapter”. The word pass-through means your iPad delivers Dolby Digital 5.1 audio to an AV receiver/amplifier that decodes AC3 rather than decodes the audio on its own. Since iPad does not have an HDMI out port, you need to use an AV Adapter to connect iPad with HDMI. How to have new iPad play HD movies with Dolby Digital 5.1 audio? 4. An AV receiver that supports AC3 decoding. And to watch iPad video on HDTV, you’ll need a 2nd HDMI cable to connect AV receiver with HDTV. 1. 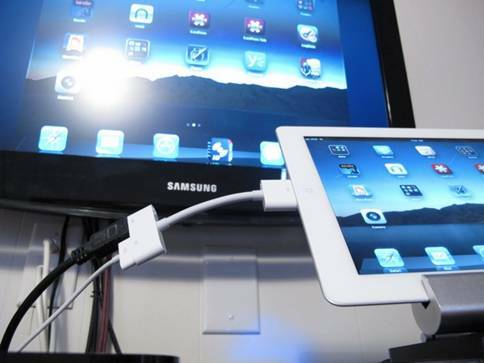 Plug the Digital A/V adapter in to your iPad 2. Make sure the adapter is seated well. 2. Plug the HDMI cable into the smaller of the two slots of the adapter. 3. Next, insert the plug on the other end of the HDMI cable into an open HDMI port on your AV receiver/amplifier. 4. If you’d like to mirror iPad screen to your HDTV, connect AV receiver with HDTV using another HDMI cable. 5. Now press play on your iPad’s Videos app, you’ll get HD video and Dolby Digital 5.1-channel surround sound through a single cable. If the HDTV does not show iPad screen, check if you have switched the input on your HDTV to the right HDMI connection port. Use your dock-to-USB cable and USB power adapter to keep your iPad charged while connected if necessary. iPad to play MP4 with Dolby Digital 5.1 sound? - Both tracks must be provided. - The AAC track should be first and it must be enabled. - The AC-3 track should appear after the AAC track and it should be disabled by default. If you want to keep original AC3 audio and still enjoy the movies on iPad and Apple TV, convert your videos to M4V and ensure there’re both AAC stereo and AC3 5.1 audio track included. Learn more details at Convert Blu-ray for streaming to ATV 3 with Dolby Digital 5.1 pass-through .